Hello! It's week 2 for the current CR84FN Challenge! If you haven't played along yet, you have just under a week to play in CR84FN46. 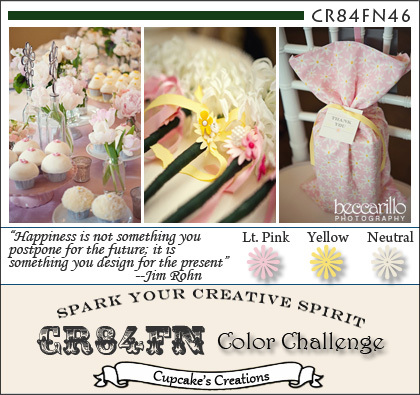 Our color palette is Light Pink, Yellow and Neutral. Photos courtesy of Becca Rillo Photography. Accessories: Die-namics You Move Me, Die-namics Mini Tabs Foursome, Die-namics Simply Scallops Medium (MFT); Corner Chomper (WRMK), Markers (Copic), Star Dust Stickles (Ranger), Ribbon, Button, Twine (May Arts), Foam tape, Thread, Sewing machine. Oh so cute! I love the hearts all in a pile! This is sooo cute! That bunny is adorable and his glittery hearts are perfect! Adorable, Stephanie!! Love the sparkly heart and gorgeous bow!! What a cute card Stephanie! 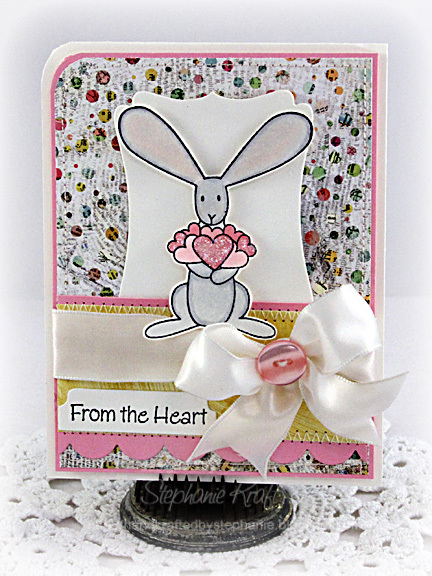 Love the shimmery hearts and the way you shaded the bunnies ears! This is so cute! I just love the shiny hearts! And the paper selection is awesome! So cute Stephanie! Lovin this sweet rabbit with his abundance of hearts! Stephanie, LOVE all of your different papers and scallops and stitching and of course that bunny with the hearts is ADORABLE! Such a SWEET card! I am swooning over this Steph! Flopsey looks ADORABLE and I LOVE the sparkly hearts! So KA-UTE Stephanie! The bunny is adorable! The DP is AWESOME too! Oh, gosh--that bunny is just adorable! I love how you glittered just SOME of the hearts for contrast--genius!